This is part 2 of my review of Norwegian’s Premium class seat and service on its long-haul Boeing 787 aircraft. 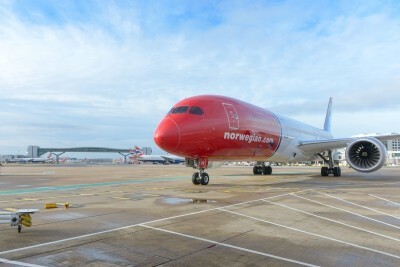 Part one (click here) of my review of Norwegian Premium described my experience on the outbound flight from London Gatwick to JFK Terminal 2 in New York. Norwegian provided my Premium ticket free of charge whilst HFP covered all of its other expenses. Actually, I lied. Part 2 is NOT about “Norwegian’s Premium class seat and service on its long-haul Boeing 787 aircraft” as you will see ….. Unfortunately my flight back to London wasn’t as smooth as the outbound. My Norwegian flight from New York JFK was scheduled for 23:00. However, during the day I got a text message informing me that my flight was going to be 2 1/2 hours delayed. 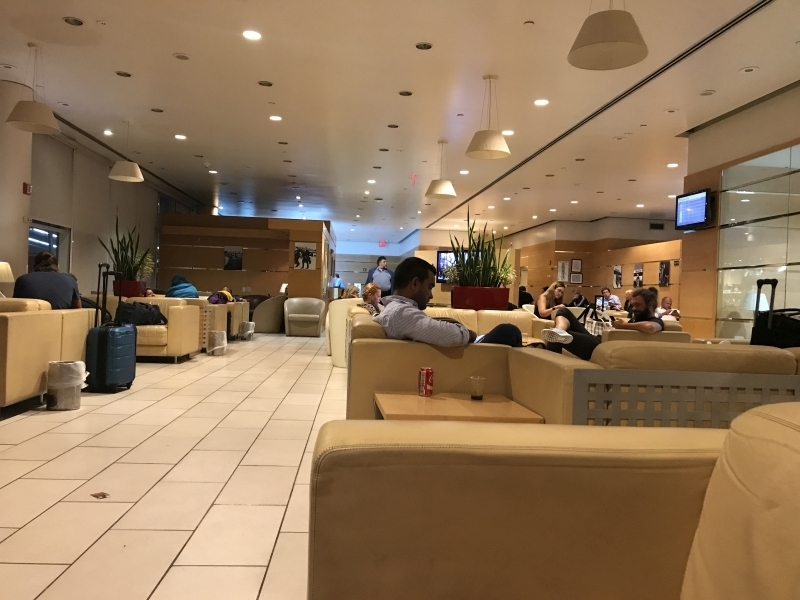 Knowing I could use the Alitalia lounge as a Norwegian Premium customer, I arrived at the airport three hours before the new departure time. This was 22:30. With my Premium ticket I could also use the Fast Track line at JFK Terminal 2 security. This doesn’t seem any better than the British Airways ‘Fast Track’ line in Terminal 7, however, and with a large number of overnight flights departing it still took me 30 minutes to get through security. When I was finally at the lounge I was a bit disappointed. The Alitalia lounge was basically a large room with a lot of sofas. That’s it. However, as it was almost midnight when I arrived, I was just glad to be able to lay on a sofa and drink some wine. There were no proper glasses in the lounge and I had to drink my wine from a plastic cup – which is only ever acceptable on a plane or at a picnic. 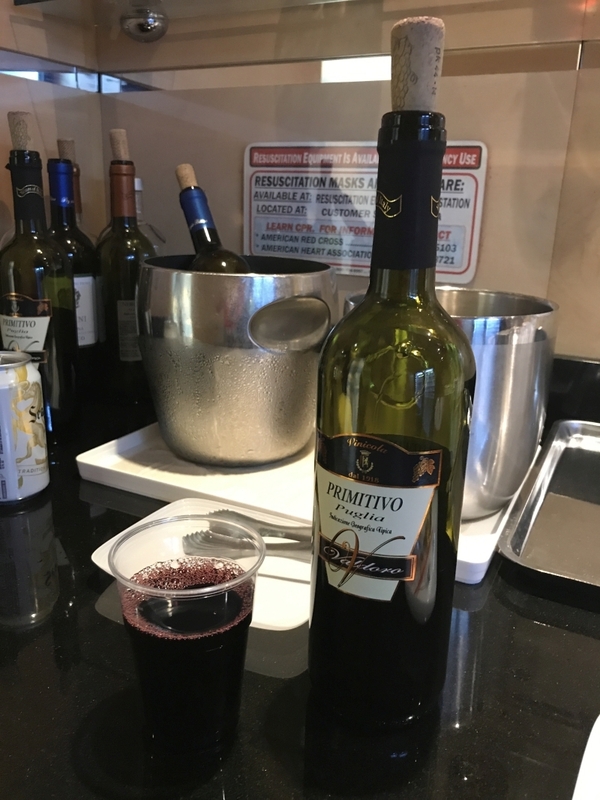 After about an hour in the lounge there was no more wine left. I waited for it to be replaced but I’m not sure if it ever was as we were all thrown out of the lounge before I could go back to check. I know that the lounge wasn’t operated by Norwegian, but it would have been nice for it to stay open until boarding time. Instead we had to stand at the gate for another 20 minutes. Arriving at the gate I realised that the aircraft was not a Norwegian 787. When we boarded, it was clear that it did not have Norwegian crew either. There was no explanation given for this switch, although Norwegian is known to run a very tight schedule with virtually no flexibility if any of its aircraft experience problems. Whilst this could have been a mess, it turned out remarkably well for the Premium passengers. It turned out that we were getting a chartered Boeing 777-200ER operated by EuroAtlantic Airways, and it had almost fully reclinable seats. This was perfect for an overnight red eye flight when sleep is your only real concern. It may have been less fun in Economy where sleep was always going to be less likely. The aircraft did not seem to have an entertainment system and also did not have any power sockets or USB chargers. Even in Premium, I wouldn’t have wanted this aircraft for a day flight without any IFE or power sources. Given the delay to what was already a late departure time, literally the entire cabin chose to sleep immediately. I have no idea if a meal would have been available or not. 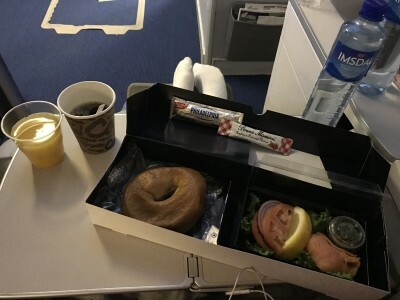 Before landing in Gatwick South breakfast was served, in the standard Norwegian cardboard box, with a bagel, cream cheese, salad and salmon. Is Norwegian Premium better than BA’s World Traveller Plus or Virgin’s Premium Economy? Flying long-haul with a low-cost airline may sound like a bad idea if you picture your last easyJet or Ryanair shorthaul experience, but Norwegian is actually doing a great job. Their Norwegian Premium product can definitely compete with BA’s World Traveller Plus. I’ve never flown Premium Economy on Virgin Atlantic, although Virgin’s seat size statistics (less pitch than BA WTP, slightly wider seat) still favour Norwegian Premium. With Norwegian Premium, you get Fast Track security (not on BA), lounge access at these airports (not on BA), two checked bags (20kg each, slightly worse than BA’s 2 x 23kg), meal service (similar quality), complimentary drinks (as on BA) and – most importantly – legroom with a huge 1.16 m pitch! The only area where British Airways might win is the food presentation. If you prefer china, menus, linen napkins and glasses, BA’s World Traveller Plus could be more convincing. That said, the taste and quality of the Norwegian food was pretty good. Whether Gatwick vs Heathrow works best for you is a personal preference, driven by where you live or work. I will ignore the fact that I didn’t get to fly back on a Norwegian aircraft. The switch to EuroAtlantic worked out well for Premium passengers who got something very close to a fully flat bed. I did appreciate that despite having some technical issues Norwegian made sure we’d get back to London with what I would call a medium delay by long-haul standards. Looking at flights towards the end of October, you can get Norwegian Premium return flights as well as BA World Traveller Plus return flights for £850. As Premium includes food and luggage you can, unlike Economy, compare these prices like-for-like. Basing my review purely on the outbound flight, I’m happy to recommend it to you. The Norwegian website is here if you want to learn more. Agreed, I doubt any other airlines out of their home bases could do mucb better than this, and in many cases it would likely be a whole lot worse. If you ask me, providing you with many hours notice and laying on a charter aircraft with better seats with only a 2.5h delay is a huge success for Norwegian. Whilst you acknowledge this in your conclusion I don’t think it’s fair to them to build the story with talk of disaster in part 1, I almost didn’t even bother reading part 2 for that reason alone. Apologies Anika, I confused Nicks choice of words with my recollection of your ending to part 1, on double checking I see you merely used the word ‘unfortunately’. That said I was still anticipating a disaster like Nick mentions but with hindsight that clearly owed more to what I have previously heard about Norwegian than your reporting. Re ‘ancient tin can’ – given that the new Dreamliners are a selling point, I think for some people ending up on a twenty year old 777 without IFE would be a huge disappointment. As regards checking in late on the way back as you’d been informed take-off was late…am I right that Easyjet, for example, still requires you to check in according to the ORIGINAL timetable? Or is this only if you’re checking in luggage?! I even had BA challenge me once at Heathrow and attempting to deny me checking in even though the flight was 2 hours late. I insisted and they gave in. It made me wonder if following an airline’s advice to check in later is actually a way for them to deprive you of a compensation claim? I always regard such messages as helpful for telling me I can expect to eat at the airport (rather than cramming something in before leaving for the airport), need more to read etc, and don’t need to panic if check-in queue is long, but otherwise stick to original timing plans. Norwegian’s text said that the 23:00 flight was delayed, new departure time was 01:30 and check in would close at 00:30. What is there best source for average on-time statistics? A one off delay isn’t as much of an issue as knowing it happens all the time, if it does. Agreed, it’s very common, and in my worst experience ended up with my flight being held at the gate for three hours, _after boarding with everyone strapped in_ while they attempted to reconcile their Dreamliner manifest against the HiFly A340 (25 years old, no IFE) that they had leased. The crew told me they had been on duty since 06:00 that morning, and it was 19:00 by the time we departed for the seven-hour flight. I have no idea how that was safe or legal. DY then declined my EU261 claim for the three-hour delay saying that it was a lightning strike that grounded their original aircraft, so the fact that their ground staff bungled the paperwork was irrelevant. I got paid in the end, but after the CAA intervened. I think that that 11pm NYC flight is often delayed because of their tight schedule. I loved our LGW>JFK flight on Norwegian, but after a 6+ hour delay at JFK with that 11pm flight, with no food or water given for about 3 hours, and ground staff that only appeared at 2am to tell us they didn’t know anything, I wouldn’t recommend the airline. I agree that the 11pm flight is a killer. Even when on time it isn’t especially pleasant! The new earlier flights should be a win for that.. everything else I love about Norwegian! Those East Coast night flights back are so awful due to the timing/”short” flight that I’m amazed there are not more daytime offers than the odd BA/AA early morning flight from JFK! Unlikely. Their market segment is made up of people for whom price is practically the only concern. As long as they continue to have rock-bottom fares and successfully dodge EU261 claims, they have no reason to change. Useful info, thanks for the reviews. Norwegian do seem very marginal compared to status passengers on BA WT+ or Virgin PE. The risk of delays and irrops on long haul routes they fly 3 or 4 times a week feels too high quite honestly. As to the reviews. Is there 1 or 2 toilets in premium on the Norwegian 787? It looked like two in one image. How many drinks runs do you get? On the day flight do you get PDB, a pre-lunch drink? A refill of Cava? How hot / cold is the cabin kept at? I would probably second this writer’s opinion had it not been for the unfortunate experience recently. I was indeed looking forward to my first Dreamliner flight in premium class on Norwegian from Gatwick to Los Angeles. As it was likely to be one of my last flights after 40 years of travelling this route on other aircraft, I had chosen a window seat on the Premium Norwegian flight because of the price, and the seat. Whilst the enormous legroom is undisputed, I was extremely disappointed to find my seat did not function as it should! It wouldn’t recline properly and the leg rest wouldn’t work! Nobody could fix it until, I was told, “an engineer could come on board in Los Angeles”! That said, I was provided with half a dozen blankets (my idea) upon which to prop up my legs, though it wasn’t such a great solution. 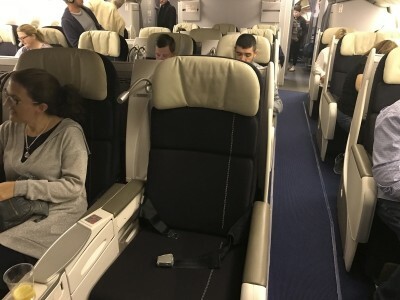 The only empty seat was in the middle row, between two passengers. I chose to stay at the window as it was a daytime flight, and I enjoyed the views. It is correct though, that if the passengers in front immediately recline their seats fully, put on their masks and cover their heads with blankets, as my fellow passengers did, it was nigh on impossible to get out. Even the passenger next to me, on the aisle, had difficulty. With no space at all next to the window to escape, I would consider an aisle seat next time. I enjoyed the meals, and the drinks, which were pretty much unlimited upon request. I found the entertainment system perfectly adequate, and caught up on as many films as I could in the time I had, though I did use my own headphones for the same reason quoted in the review. Norwegian were fairly reasonable about my complaint afterwards, but would not refund me the difference between Premium and Economy, offering instead £25 cash or 1000 cashpoints in a Gift Voucher. Having calculated 1000 cash points to be the equivalent of approximately £89, I accepted that compensation and hope my next flight on Norwegian will be more successful. Some people get very excited about the Dreamliner but on a recent trip we went out on 777 and back on 787 and there was no material difference. I know some people who do swear they can tell the difference in how they feel when they land, given the different cabin pressure, but I admit I don’t. The slightly bigger windows are obviously handy but not so obvious. Generally, though, you are at least getting a shiny new aircraft. I did a 777-200 on JAL over Easter and it was a dump. I fly the A380 regularly on LHR-AUH and in reverse but sometimes you feel the pilot has the pressure up too long and I’ve complained as one flight really hurt my ears. Normally I hardly feel anything. So I don’t think it is so much to do with the plane as with the pilot. Flew on 787 only twice and on 380 once, but quietness and almost normal air humidity instantly made me a big fan of both. I remember having very nasty colds after flying long haul in old 777 (or 767, don’t remember) and inability to sleep because of extremely dry air (even in fully flat business seat). Why didn’t you just wait and read it later? 3. Because – and this is the actual reason – if I sent Part 1 first, Part 2 would sit at the top of the home page with Part 1 below it. This would make the site look very weird. Well looks like they did a better job than my last AA biz class experience JFK-LHR – delayed by 30 min, then 60, then 90, then by 2h at a time right through the night until finally leaving approx 11h late. $20 in vouchers given, usable at one location for a couple of hours before they shut. Totally useless bunch – Norwegian would have been a whole lot better in that sort of situation it seems!